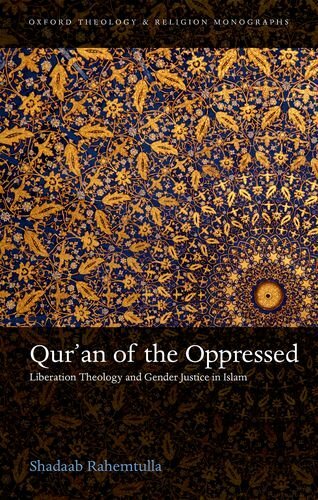 Rahemtulla (Shadaab), Qur’an of the Oppressed : Liberation Theology and Gender Justice in Islam, Oxford, Oxford University Press, ("Oxford Theology and Religion Monographs"), 2017, 256 p. ISBN 978-0198796480. This study analyses the commentaries of four Muslim intellectuals who have turned to scripture as a liberating text to confront an array of problems, from patriarchy, racism, and empire to poverty and interreligious communal violence. Shadaab Rahemtulla considers the exegeses of the South African Farid Esack (b. 1956), the Indian Asghar Ali Engineer (1939-2013), the African American Amina Wadud (b. 1952), and the Pakistani-American Asma Barlas (b. 1950). The authors considered all proritise the Qur’an over the hadith. Rahemtulla considers this an essential move for a Muslim liberation theology and concludes with proposals with a new construal of what a politically radical Islam might mean, sharply differentitated from Islamism. This work provides a rich analysis of the thought-ways of specific Muslim intellectuals, it substantiates a broadly framed school of thought. Rahemtulla draws out their specific and general importance without displaying an uncritical sympathy. He sheds light on the impact of modern exegetical commentary which is more self-conciously concerned with historical context and present realities. In a mutally reinforcing way, this work thus illuminates both the role of agency and heremnetucal approaches in Modern Islamic thought.